Our cookie dough recipes were all adapted from our mom’s original recipes. 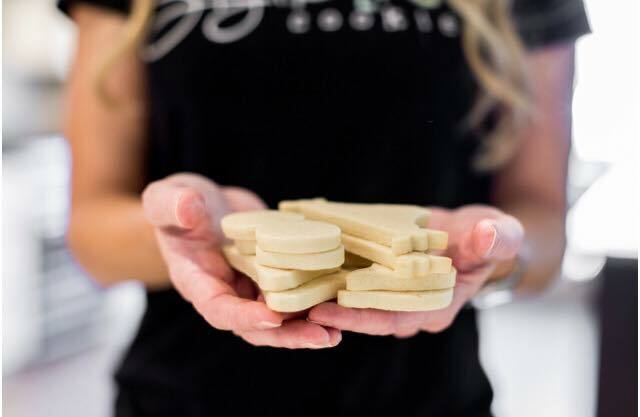 We’ve perfected them so they’re the perfect canvas for any cookie artist with nice straight sides, crisp edges and a flat surface. The cookies bake up soft and delicious with just the right amount of sweetness. Our techniques for rolling and cutting the dough will help give your cookies those clean straight edges and help keep them from spreading during baking. Because you’re not adding extra flour to the dough as you roll it out, you can use every last scrap of dough! You can adjust baking times if you like a softer or crunchier cookie. Don’t be afraid to experiment with flavors! We’d love to hear if you create a new one that you love! Thank you for sending in your questions! They’re important to us. We will send a response as soon as possible. Thank you for contacting us!